Danger ahead! Newfie Girl with a Spatula, a Shovel and a Load of Chocolate Chips. 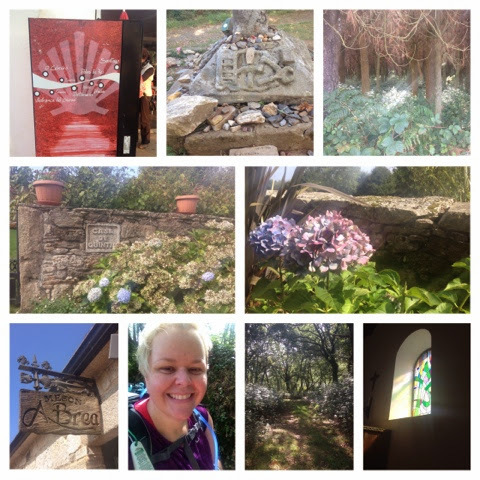 : Camino de Santiago Day 12-What the devil have I been doing all this time?? Camino de Santiago Day 12-What the devil have I been doing all this time?? I was delayed out of London to Madrid, missing the train to Leon. Found a bus which got me to the Albergue in Leon at 500am. I started to walk with Krista at 630am, that's about 45 minutes of sleep before a 20km hike. The hike out was met with a thunder, lightening and rain storm... I was thrilled!! Each day thus far has been a study in contrasts for me. Moments of pure energy followed by exhaustion. I think that's my lot for this... And I don't mind it a bit. Today was the walk from Portomarin to Palas de Rei. Beautiful weather-check. Healthy legs and feet-check. Lots of cafe con leche-check. I walked with a South African/Australian, a Spaniard, and a Canadian. Each had different interests but we all had the same look on our face... Joy.